Gamers and office users alike will enjoy the great value of the HP Pavilion 25xw monitor, with its high-quality IPS display and its ability to connect by HDMI cable to a variety of gaming consoles as well as every type of computer. 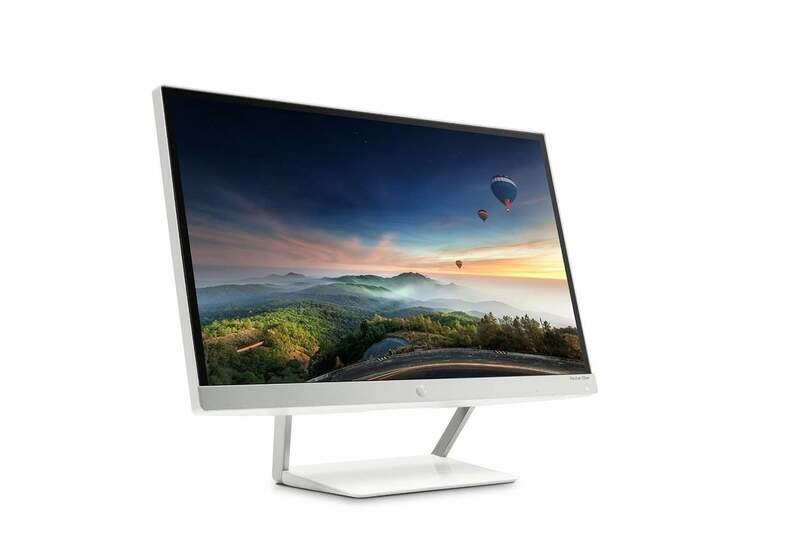 Hewlett Packard’s modernistic WEDGE stand design combines with a lack of bezel framing to give this monitor a unique and classy look on any desk. If you are satisfied with the pre-set features and do not feel a need to adjust or customize your settings, this monitor operates wonderfully within the parameters of its limited programmability. The LED screen gives almost no bleeding of color around the edges. Its brightness permits it to offer clear and crisp images even in a sunny or brightly lit room. With a fairly quick response time of 7ms, along with a 60 Hertz refresh rate, gamers and movie watchers can enjoy high picture quality without any image tearing or ghosting, and with the V-sync engaged, you can avoid frame shuddering and flickering. With its bezel-less frame, the screen feels like an HDTV screen rather than feeling like a desktop computer monitor. The response time of 7ms, fast moving scenes are adequately portrayed, although gamers might note some minor amount of blurring in the images and action of their games. Even the smallest of fonts are well formed and easily read on this HP screen, and the high definition content is highly detailed and crisp in appearance. The monitor was tried out with the 64-step Grayscale test offered by DisplayMate, resulting in findings that this screen can display every one of the 64 shades of gray. The very darkest shade of should have been someone darker, but it was still distinguishable from the others. This minor glitch results in a small amount of detail loss in the test photo, but even most black and white photographers would still find this level of grayscale serviceable. As with most monitors with IPS (In-Plane Switching) technology, this model provides a wide angle of viewing, giving optimal vantage points across the viewing range. Even when two people share the screen for gaming or shared viewing, the view is equally high quality regardless of where each user sits. All in all, the HP Pavilion 25xw PC monitor can be considered a strong performer. The color display is uniformly saturated evenly across the screen and holds its integrity when viewed from a wide range of angles by viewers in different positions. This monitor has fewer customizable features than some monitors, but in a situation where the pre-existing settings and features already suit your use, it’s a great buy. It does rate as a good value for a gaming monitor, delivering high gaming performance, color accuracy, grayscale, and viewing angles, all for a relatively reasonable price. With the swipe of a user’s finger, the buttons light up along the bottom of the screen against the white backlight. These function buttons are not labeled, and (except for the power button) not even visible until the swipe action is applied. The HP Pavilion 25xw 1080p monitor does not have integrated speakers, so gamers and video viewers should plan on adding separate speakers to the system for audio output. The settings on the Hewlett Packard Pavilion 25xw monitor can be adjusted with the touch-sensitive buttons at the bottom front of the screen. Alternatively, you can personalize the settings with the Hewlett Packard My Display software, which comes with the monitor, enabling you to alter the settings using your mouse and keyboard in place of the touch buttons. You can set up the My Display options using the included wizard that enables you to select the optimal contrast and brightness levels. Additionally, it has a basic calibration function to optimize your grayscale settings, as well as a partitioning tool that enables you to define your own split screen areas and to drag-and-drop various windows to open and available partitions. The available settings include the temperature of colors (cool, standard, warm, and custom settings), gamma (high, medium, low, and off), contrast, and brightness. With the Quick View menu, you can select from five video presets (movie, photo, gaming, text, and HP Enhance+) as well as a customized setting. Given its anti-glare screen and the HP Enhance+ features, the HP Pavilion 25xs monitor delivers a sharp and unadulterated image. The energy efficient and eco-friendly features include display backlighting that is mercury free, display glass that is free of arsenic, low halogen use, and recyclable packaging. The screen Energy Star certified, using a low amount of electricity in its functions. This monitor is available with either a black or a white cabinet, allowing the user to choose the look for any office. Combined with the brushed metal stand, the monitor boasts a sleek and modern look. The screen itself features anti-glare coating, but still sometimes reflects room lighting, or even the user’s face, onscreen. The included stand is minimally adjustable, but this is a solid monitor with good delivery of visual options, and the wide angle of view (almost 180 degrees) means that the screen’s position relative to the user is less critical than it would be in a screen with narrower angles. 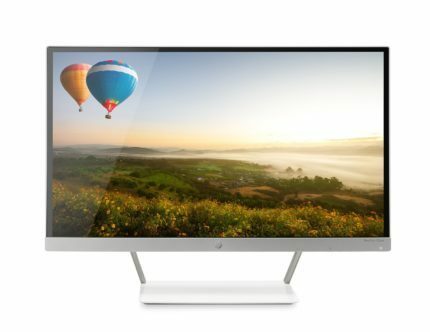 All in all, the HP Pavilion 25xw IPS monitor is a sleek, futuristic model with a thin silver-accented cabinet and a modern design with angled stand. Its aesthetics are very clean and its footprint is small on your desk. 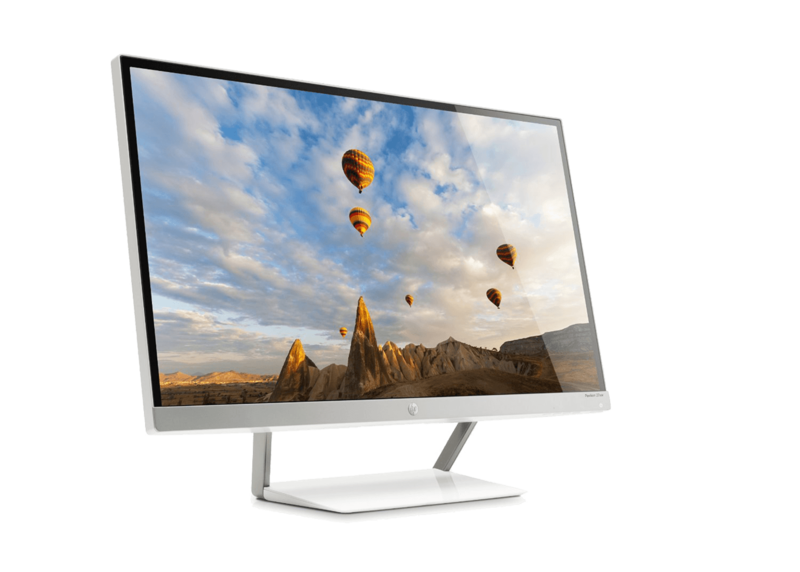 The display gives good grayscale and great color, all available at the wide angles for viewing for which this and other IPS panel monitors are widely known. The unusual design without bezel on sides and top makes the screen seem even bigger than usual in its frameless viewing. 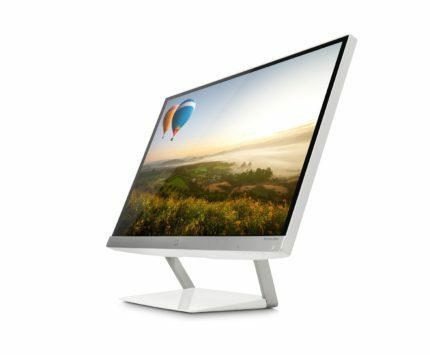 The angled stand of the HP Pavilion 25xw display is sturdy enough to withstand the use of touch-screen button use on the front of the monitor. it also adds a modernistic air to the overall appearance of the monitor. Only the bottom of the screen has a bezel, on which the function buttons appear when swiped by the user. The silver brushed-metal stand allows for tilt adjustment, but not swivel, pivot, or height adjustment. Short of tilting the screen forward or back, or placing it on another item to boost its height, the user cannot manipulate this screen to different positions. The inputs for the HP Pavilion 25xw monitor are VGA and HDMI video ports. It does not have output ports, and its limited connectivity restricts the number of available uses. Note that the monitor does not connect to a handheld or mobile devices, and does not connect by USB or DP (Display Port) to any devices. The monitor comes with an included VGA cable, but not the HDMI cable. 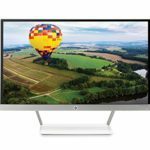 At the moment (May 2017), the HP Pavilion 25xw PC monitor is available for around $230. It also available as a 23-inch version, the HP Pavilion 23xw for $180 and as 27-inch version, the HP Pavilion 27xw, for $265. All of the monitors offer the same 1080p resolution which means that the 27-inch version provides a bit more pixelated image quality in comparison to the more detailed and spacious picture of the 23-inch version; the 25-inch model seems to be a great middle ground between the two. Overall, all monitors are reasonably priced for their sizes and image quality and offer a great performance and a reliable display. The HP Pavilion 25xw PC display is an excellent candidate for multiple uses, due to the combination of high-quality visuals and relatively low price tag. For non-professional video editing or photography use, the display features of this monitor are more than adequate. The monitor itself is sturdy and sleek to look at, adding a touch of classy style to an office even when the screen is turned off. If you don’t need a display port or USB connectivity, this is among the best choices of screens for its price range. The HP Pavilion 25xw delivers a high-quality picture with vibrant colors for a relatively reasonable price. The absence of more connectivity and ergonomic options isn’t much of a drawback considering the image quality and the price.